Alex May skates with Gliding Stars director and founder Elizabeth O’Donnell on Sunday in Hyde Park Arena in Niagara Falls. May will perform his first solo skate at this weekend’s show. The popular 1990s song “True Colors” always reminds Janine Luss of her son, Ryan. The lyrics about seeing someone’s “true colors shining through” despite obstacles describe how she sees the 14-year-old, who has autism. “Sometimes it holds him back. But a mom sees. What an amazing person I’ve been blessed with,” she said. That’s why Luss chose the song for an ice skating duet with Ryan for “Skating the Colors of the Rainbow,” a musical ice-dancing show that benefits Gliding Stars, a nonprofit organization that provides adaptive ice skating opportunities for people with challenges. Performances will be held at 7 p.m. Friday and 1 p.m. Saturday at Amherst’s Northtown Center (formerly the Pepsi Center), 1615 Amherst Manor Drive. About 114 skaters will perform with the aid of about 200 volunteers. Among the performers will be Ryan, who first started skating with the company six years ago and has enjoyed every moment of it. “He hasn’t fallen once,” his mother said. Ryan’s capacity for communicating verbally increases as he gets older, but when he first became involved with Gliding Stars, it was a different story, his mother said. “His ability to express what he likes and doesn’t like is difficult. So I’m always trying different things to see if he likes them,” Luss said. When she got him involved with Gliding Stars, his body language told her exactly how he felt about ice skating. “His face just lit up. He was laughing. He absolutely loves ice skating. He just blossoms out there on the ice. I think it’s like freedom to him,” Luss said. Since then, every time Luss announces it’s time to go skating, Ryan runs to get his coat on. “You can learn to read your child when they can’t communicate verbally. You can learn what they want to say through other means of communication,” she said. The program has helped him in other ways, too, his mother said. It provides him with an opportunity to interact with others who have special needs. And some of his other skills have improved, too. And while Ryan has never fallen down on the ice, Luss hopes she doesn’t take a tumble when they perform the duet. “The last time I skated? Not since recreationally, when I was pre-teen,” she said, adding that her first time back on skates to practice went better than she thought. “My sense of balance was there. I haven’t fallen once. And I hope I don’t. The routine is three minutes long. If I go down, it will take three minutes for me to get back up again,” Luss joked. Still, the opportunity to skate with her son will yield a lifetime of happy memories. 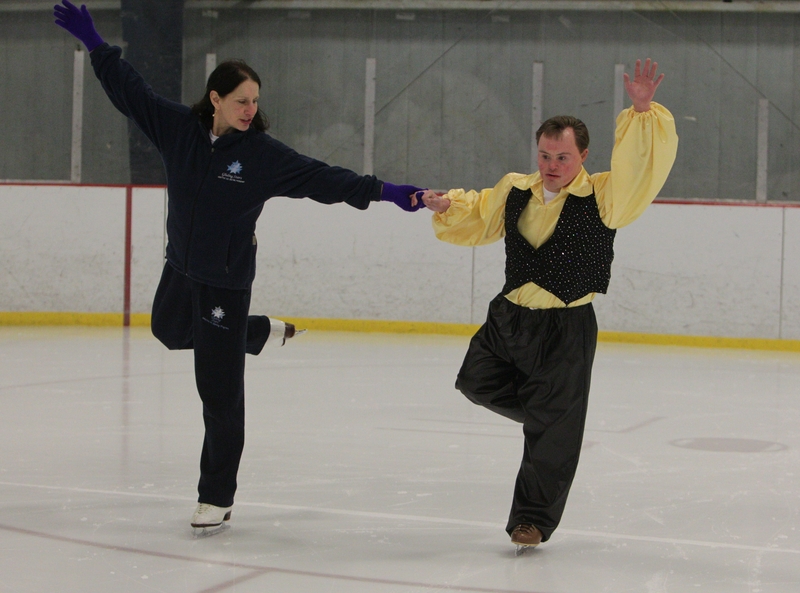 Another skater is Alex May, 24, who has Down syndrome. Gliding Stars also has helped Alex May with balance and building body strength and self-confidence, because it’s physically challenging. “He has to learn the routine, the moves. He has to learn to follow directions,” David May said. Every year, at least one of the young performers brings a tear to his eye, and each show compels him to think about things many people take for granted. “Every parent aspires for their kid to succeed, to learn and to better themselves,” he said. Tickets for “Skating the Colors of the Rainbow” are $8 in advance and $10 at the door. Children 4 and younger are admitted free. For more information, call 608-8345 or visit www.glidingstars.org.